Effect: The opponent takes all Battle Damage to this card's controller that he/she takes from a battle involving this monster. Um... Has a Burn Effect. Weak, at least compared to Amazoness Paladin. Effect only works during battle. Her Effect gives her suicidal tendencies. At the moment at least, I don't see the real beneficiary to the Effect. Ok, so if a Jinzo attacks her the opponent would take 900 damage, so all they have to do is attack with something around 1550-1900 to not take that much damage. I can't think of any combos to use her Effect without her being destroyed in battle, I'm sure there is someway, I think, especially for being an Ultra Rare. Her Effect also doesn't state "negate the damage" it basically says they take what you take. So if you use Kuriboh neither player would take damage and she would still die. The most I could think to do is direct you opponent to attack her with there stronger Monster(s) with Patrician Of Darkness or Shift, but it's not anything worth using, especially in a tournament. ArtWork: 2.0 - I see, they edit DMG, Gemini, Water Omonics and others but they didn't care about all the Amazoness girls having cleavage or huge breasts, but anyways... 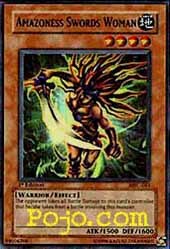 I actually think he's the lamest looking Amazoness and still don't see her point. Plus Sides: Magic Cylinder Effect, Searchable by Sangan and Giant Rat, Protected by Marauding Captain. Bad Sides: Get effect only once unless you revive it, 1500 attack is not going to cut it, can easily be destroyed via all the monster removal we have out right now. Combos: Dark Jeroid ) Decrease Swordwoman’s attack and ram it into a monster for extra damage. This card is great if you know how to play it. Best thing to do is suicide it into a beefy Monster (Jinzo and Injection Fairy Lily come to mind) and watch the end result. But, the worst part is you really can’t get it’s effect over and over. I really can’t think of a way to get this monster’s effect multiple times unless you revive it. I can only see this card as a one time use. If you could use this effect over and over, it might see a lot of tourney play. The only real play it will see will be in Amazoness decks, and I have a feeling they won’t be everywhere, but they will be around. I guarantee it. In Sealed tourneys, this could be a great help because of it’s effect, but it’s still only so good.